What Not to Wear? Straight hair! Addie Broyles shows off her new look in the "reveal" portion of taping her "What Not to Wear" episode. On most episodes of TLC's popular show "What Not To Wear," there is an emotional moment sometime during the week when the makeover subject is unhappy with the changes being made to her personal style. It's never easy to have people criticize the way you look, especially in front of millions of people. For Addie Broyles, that moment didn't come over her fashion choices – styles deemed too frumpy for her fiancee's rock-and-roll lifestyle. "When they gave me straight hair for one of my new looks, I couldn't believe it!" Broyles recalls of her "What Not To Wear" experience, which aired in March. "It just felt so wrong. I couldn't believe how strongly I reacted. I cried, I was so upset." Broyles' short, sassy ringlets are a part of her unique style. And while she was open to most of the changes hosts Stacy London and Clinton Kelly suggested during her trip to New York, going from curly to straight was not one of them. "For most curly haired women, it takes many years to accept being different,'" Broyles says. "Once you've accepted and embraced it, it felt like an insult when they tried to make my hair straight. It felt like I was betraying my curly sisters who have worked so hard to accept their own curly hair." Before coming up with the hairstyles for Broyles, "What Not To Wear" stylist Nick Arrojo consulted with her at his Soho hair studio. "He played with my hair for about 30 seconds and that was it," she says. The next day, at the show's studio, he put highlights in her hair and lightened the overall color. Then he cut it with both scissors and a razor. For the past few years, Broyles has cut her own hair, having tired of wasting her money on people who didn't know how to cut curls. "I'd had my hair short before so I was prepared for any length," Broyles says. Arrojo used a leave-in conditioner on her hair along with wax and a curl enhancer. He then diffused her hair until it was nearly dry and used a pick and his fingers to separate the curls. He then used a curling iron to add curls on top. Although she loved her new color, she thought the curly 'do looked a little like a bouffant. "But here I was, in front of three cameras and the stylist himself, so I grinned and bore it, thinking the whole time, 'Well it'll be better when I can get my own hands on it. And at least he didn't straighten it." When it came time for her second look, Broyles knew she was in trouble. "They broke out the hair dryer and a big round brush," she recalls. "And away he goes. There wasn't a mirror to see what he was doing, but I could tell he was straightening it. I didn't like it one bit." She tried to be philosophical, telling herself one of the main points of the show is to try out new things and to be open to change. "So I roughed it out," Broyles says. "They didn't let me look at myself, but I felt it on my head. They'd flattened my signature curls into something I wouldn't even recognize. I peeked at my reflection in a glass window, and that's when the tears came. I'd made it so far on the show without crying! But I couldn't help it." "They'd taken two decades of being called horrible nicknames like "Mop 'n Glo" and "Afro Sheen" and turned my hair into what I'd always thought I'd wanted – perfectly coifed, straight-as-a-board hair. But it looked like an awful wig on me. I felt like I'd been stripped of me – the me they were trying to help me get in touch with." The series producer pulled her aside and told her they would do whatever she wanted. If she wanted to go back curly, they would do it. But Broyles wanted to see what Stacy and Clinton had to say about it. 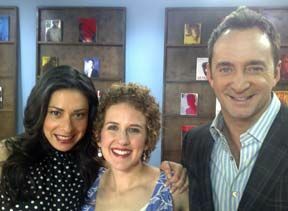 Broyles enjoyed working with Stacy London and Clinton Kelly. "What do you think?" she asked. "They knew. They saw right away what I was talking about. Stacy sat me down on the couch in her office and listened to my whole schpeal about the struggle to embrace my hair as it was. She was willing to let me do whatever I wanted, but she wanted me to at least think of doing a single outfit with straight hair and facing down this demon on camera. She wanted me to show that curly hair, mine or anybody else's, doesn't have to be as limiting as it may feel sometimes. She wanted to show that curly haired people have options, just like the straight-haired folks I envied as a younger person." So while she sported the straight style on camera for the second look – feeling like an imposter the entire time – she happily rocked her curls for the big reveal back in home in Austin, Texas – her engagement party. Despite the tears, Broyles felt her "What Not To Wear" experience was overwhelmingly positive. In addition to the suitcase full of cute new outfits she brought home, she says she's loving her curly cut and color. "I've really enjoyed it now that I'm back and can actually style it myself," she says. "My routine includes a leave-in conditioner and a wax-based product, but no blowdryer or curling iron. I don't plan on it being straight ever again. I'm just not a straight-haired gal."